My layout gets a lot of compliments on the scenery – especially the large meadow around the turntable at Port Rowan. Those of you who want to see how I create meadows will enjoy the final, regularly-scheduled instalment of The Roadshow, currently playing on TrainMasters TV. With my friend Chris Abbott in the studio to help, I demonstrate how I do basic ground cover, then add grass, bushes, weeds and flowers. The segment runs about an hour and covers all of the steps, step-by-step, to create basic yet convincing scenery, ready for super-detailing. While I model a railway set in the 1950s, I think my meadow-building techniques would make for a good start on the overgrown railway land bordering a modern right of way – the kind one sees right outside the TrainMasters TV studio. 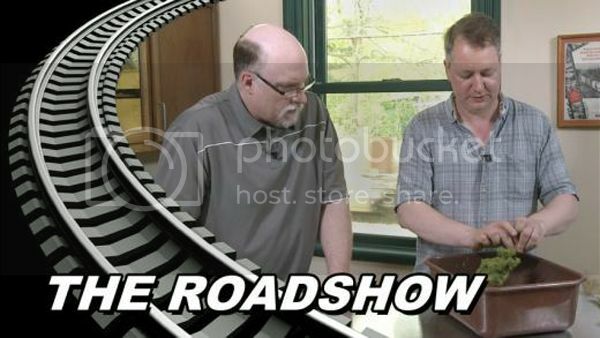 Thanks, again, to TrainMasters TV brass hat Barry Silverthorn for letting me be a part of his terrific show. This entry was posted in grass, weeds and bushes, landforms, S Scale Workshop, S Scale Workshop-Modules, scenery, TrainMastersTV by Trevor. Bookmark the permalink. Just finished watching your excellent scenery presentation on TMTV. Well done! It comes at a great time because scenery is the next stage on my HO scale switching layout. The materials and techniques used were very effective. Hope to put them to good use on my rural landscape. I also just finished viewing the scenery episode. Watching a hands-on demonstration as you’ve presented makes the process so much easier to understand than reading a scenery book with a few pictures. And it’s especially gratifying to see the process done on a scenery style that you’d like to build yourself. As with Michael, I’m looking forward to putting these techniques to good use when my scenery days finally arrive.